Custom Tile Showers, What’s the Skinny? Updated July, 2010 What do they cost? As with most things not made in Asia, more than you thought they would. A properly constructed shower requires a lot of time to build. As we all know, time is money, and a craftsman worth his salt knows what his time is worth. Due to the endless possibilities and the nature of custom work there is no hard and fast answer as to what they will cost. 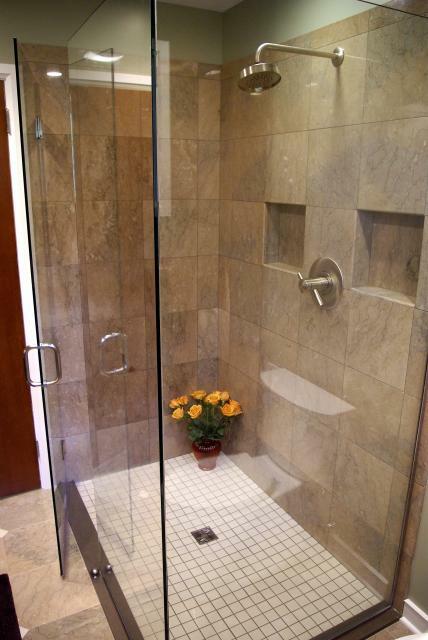 Creating a luxury tile shower is not an inexpensive proposition. It is not uncommon to spend over 6 thousand dollars on a custom tile shower with a basic good quality plumbing fixture and the sky is the limit on where you can go from there. [caption id="" align="aligncenter" width="133" caption="This custom marble shower has a very simple shower valve and trim with euro-(frameless) glass walls and door."] [/caption]How are they built? The technology of setting tile and building showers has come a long way over the years. Schluter Systems is a German company that has been making innovative systems that are endorsed by many professional tile setters the world over. Schluter's shower system is based on a waterproof membrane called Kerdi which is adhered to the walls and floor of the shower using thin-set mortar. Schluter has also recently released a new product in 2010 that consists of their Kerdi membrane pre-bonded to a foam board, eliminating the need for a separate substrate to be installed before the Kerdi. Schluter's products have been around long enough to have established a positive track record and are considered by many to be the best way currently available to build a shower. We often use these products to build our showers. 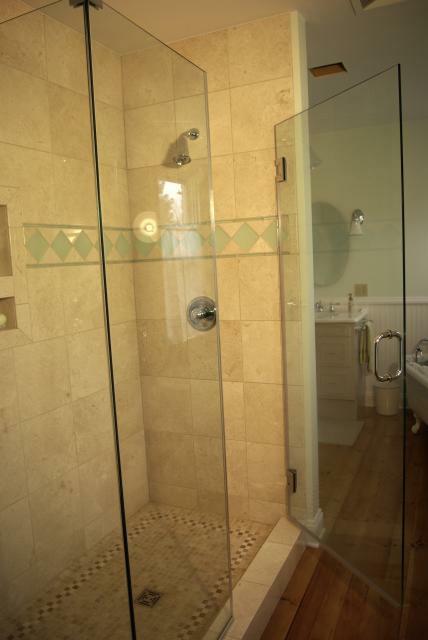 Another very effective method to waterproof showers is by using liquid applied membrane system. One of my favorites is Mapei's HPG in which troweled on liquid paste goes over a fiberglass mesh to create a waterproof membrane and a crack isolation membrane. Other liquid membranes that do not require a fiberglass mesh, or only require it at corners and joints in the tile backer are also very popular, such as Mapei's newer WaterDefense, Custom Building Products' Redguard and Laticrete 9235. We find that in certain applications these product works very well and offers certain advantages over Schluter's system. It is important to note that not all products available have been accepted as suitable shower pan waterproofing materials by all code bodies, so you'll have to do your homework with your local municipal code enforcement office to find out if the product you want to use is permissible. Another important aside is that not all code officials are aware of all systems, and sometimes you need to provide relevant documentation that a product has in fact been approved by a building code's governing body. Manufacturers are more than happy to help you with this information. Many products cite being IAPMO listed as shower pan liners, however, IAPMO is a testing laboratory dealing with plumbing products and is not generally recognized by building codes. To indicate code compliance look for the words "approved and meets ANSI A118.10 standards for use as a shower-pan liner." 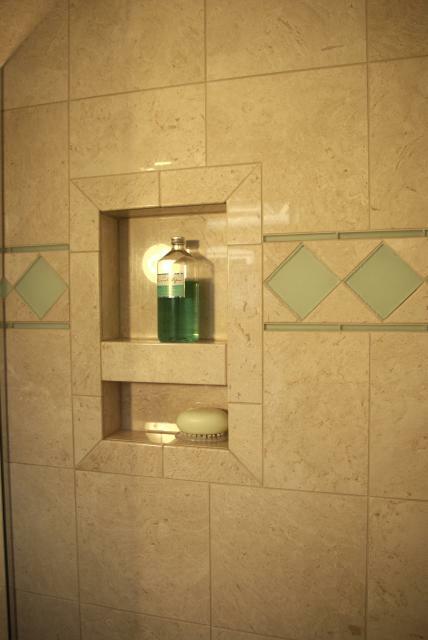 The single most important thing to ask your tile shower installer is how the shower base is constructed. The waterproof membrane MUST be installed over the pre-slope, period. The pres-lope is traditionally a thick-bed mortar base and contemporarily a foam base that is sloped toward the drain at 1/4 inch per foot. If your tile contractor says they will install a waterproof membrane flat on the sub-floor and then lay the mortar bed RUN!! A leaky or mold ridden shower offers only one option: rip it out and start over! [caption id="" align="aligncenter" width="150" caption="For this shower with it's low profile threshold we used Mapei's HPG to waterproof well beyond the shower sill onto the tile floor underlayment."] [/caption]What about a bathtub? 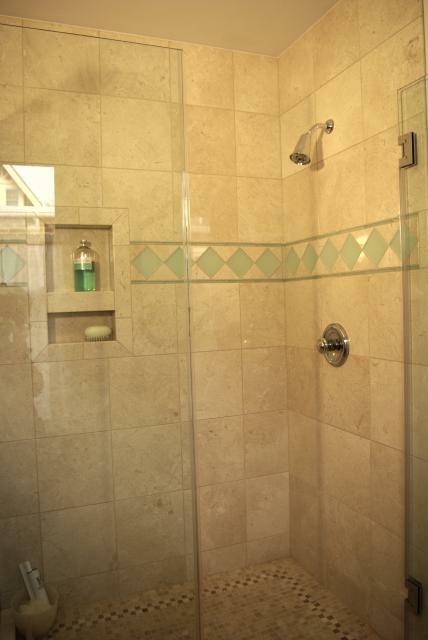 Many people are fearful of having a full bathroom with no tub. While it can be detrimental to have no tubs whatsoever in the house, a master bath does not need to have a tub at all. Creating luxury showers has become increasingly trendy AND practical for modern lifestyles. People are drawing baths almost exclusively for their young children, and never for themselves. I constantly have clients telling me they have never used the whirlpool in their master bath, and are ready to rip it out and create a spacious custom tile shower, or better yet, a custom tile steam shower. 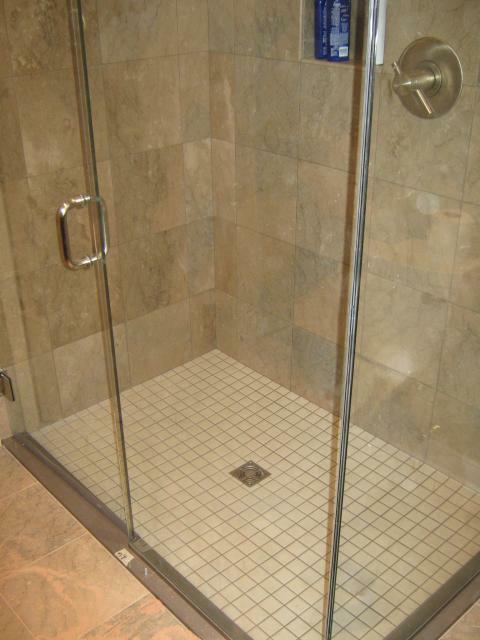 Please visit the rest of our website to learn more about our company or fill out our online request form if you'd like a consultation about building your shower. If you prefer to call our phone number is 717-876-0113.